HEIGHT RESTrICTION FOR THE CHILDREN'S COURSE? 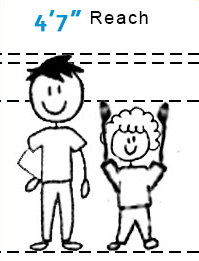 The child must stand with their feet flat on the ground, raising their hands above their head. Measurement is taken at the tips of their fingers. They must have a reach of 4 foot 7 inches otherwise they will not be allowed to participate on the children's course. The child is up in the tree's on their own with a guide present, you may be on the ground watching but you will not be in a position to assist them clip or unclip therefore it would be unsafe for them to do the course if they can not reach the required height. The youth or adult must stand with their feet flat on the ground, raising their hands above their head. Measurement is taken at the tips of their fingers. They must have a reach of 5 foot 7 inches otherwise they will not be allowed to participate on the youth/adult course. 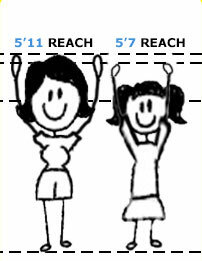 They must have a reach of 5 foot 11 inches otherwise they will not be allowed to participate on the youth/adult course. This is a safety requirement. Please note that Guests under the age of 18 must also have their waiver forms signed by their parent or legal guardian.